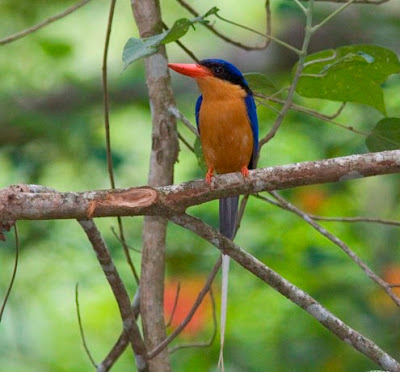 Red Mill House - Daintree Birdwatching: At last - Paradise Kingfishers galore!! 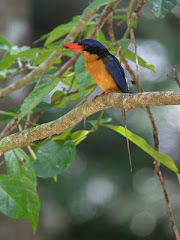 At last - Paradise Kingfishers galore!! 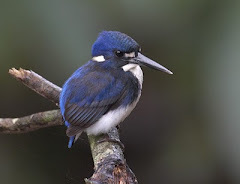 Rather late, this year, but the Buff-breasted Paradise Kingfishers have arrived from New Guinea for the breeding season and are here in Daintree in large numbers. Particularly active and calling madly along Stewart Creek Rd - the patch of forest at the end of the road is home to at least 8 birds at present. 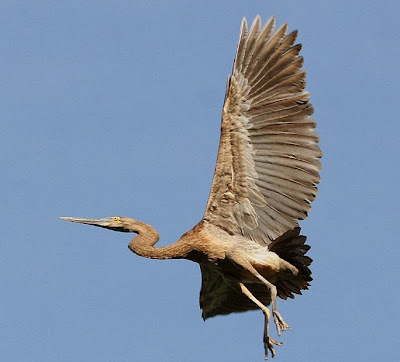 Another 3 or 4 can be seen and heard at the beginning of the road, close to town. These birds are a favourite with everyone. Also, in the same areas are other fabulous birds like Yellow-breasted Boatbill, Superb Fruit-Dove, Pied Monarch, Black-faced Monarch and Wompoo Fruit-Dove. Early morning seems to be the best time! The Daintree River cruises have been spectacular lately with good sightings of nesting Great-billed Heron and Papuan Frogmouth, Cotton Pygmy Goose and Latham's Snipe, Little Kingfisher, Shining Flycatcher and many others. The garden at Red Mill house has been excellent for Azure Kingfisher, Cicadabird, a range of honeyeaters, Varied Triller and Eastern Koel. Our two Olive-backed Sunbird nests have suffered different fates - one taken by a Black Butcherbird and the other surviving (fingers crossed) with the aid of a very unattractive 'Scarecrow' near the nest. It even frightens us when we forget it is there, but the sunnies don't seem to mind it! No photos - we may get done for defamation! !